Detroit, Michigan, June 7, 2016 (Newswire.com) – In March 2017, the National Women’s History Project will celebrate 37 years. And Dr. Lisa Wicker, founder of Linwick & Associates, LLC will celebrate also with an awards ceremony, business round-table, talent marketplace and dinner gala. Twenty-five top business women in Metropolitan Charlotte and Metropolitan Detroit will be recognized and awarded for their outstanding achievement in competitive fields and their dedication for being exceptional role models of what a woman can do. Young rising star girls will be acknowledged for their excellence and awarded the LaVerne Gardner Lindsay Stewart Scholarship. Dr. Lisa Lindsay Wicker, founder of the Career Mastered Women’s Global Business Collaborative and Women’s History Month Leadership in Action Awards said about the event, “Today’s women leaders are Game Changers. They take charge of their careers and take charge of their futures. These women have made their mark in business and are exceptionally strong role models of what a woman can do. Giving recognition to these deserving women will also inspire future generations.” Proceeds directly support Excel Village Center for Learning, a non-profit organization whose mission is to provide career planning for youth at the elementary, junior high and high school levels. Nominations are currently being accepted on-line until June 30, 2016 for the woman who is Iconic, has unending Presence and who has demonstrated her career Power while making a compelling mark on business. In addition, sponsorships commitments are currently being accepted until August 31, 2016. To view the class of 2016, nominate a candidate, or provide a sponsorship, log onto www.careermastered.com. 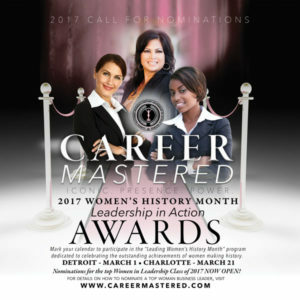 Save the date for the 2017 Career Mastered Women’s History Month Leadership Awards and activities which will be held on March 1 in Detroit, Michigan and on March 21 in Charlotte, North Carolina. Career Mastered is a growing global women’s business collaborative. It is the only platform of its kind that combines women’s history, leadership recognition awards, networking, talent access, and youth development to accelerate women’s careers while making a positive difference and impact on the global business environment. The goal is to make a powerful difference in women’s leadership aspirations while supporting future generations. Career Mastered presents the leading Women’s History Month Awards in North Carolina and Michigan, honoring today’s women leaders who are Game Changers, who take charge of their careers and their futures. The Award honors amazing women who have made a compelling mark on business and are exceptionally strong role models of what a woman can do. Founded in 2015 by Linwick & Associates, LLC. Career Mastered Awards celebrates and acknowledges the victories, challenges, and stories of the women who have helped to make our country what it is today. About Linwick & Associates, LLC. Linwick & Associates, LLC is a global human resources consultant firm with offices in Metropolitan Detroit and Charlotte, NC. The mission of the company is to create organizational value through people. Its Founder, Dr. Lisa J. Wicker is internationally recognized as a leader in human resources management with more than 30 years’ experience in organizational dynamics and change management across Fortune 500 Companies and Industries. She has been featured in Jet Magazine, recognized by the Detroit News as one of the most successful women in Detroit. Corp! Magazine recognized her as top Diversity Leader in Michigan, Black Enterprise recognized her as a leading Diversity Champion in America, The Michigan Chronicle dubbed her a Trailblazer and UPTOWN Professional Magazine named her one of America’s top executives.